If you’re looking for advice on what to do about acne, the internet is virtually overflowing with opinions. You can read about acne superfoods, about face masks, about miracle supplements, and about prescription drugs (though this is not an exhaustive list by any means). Unfortunately, most of these methods aren’t founded on good science. Instead, they come from personal experience most of the time. They are also sometimes plain old guesses, and stuff that people kind of have a hunch about. One of those acne things people kind of have a hunch about is detox. 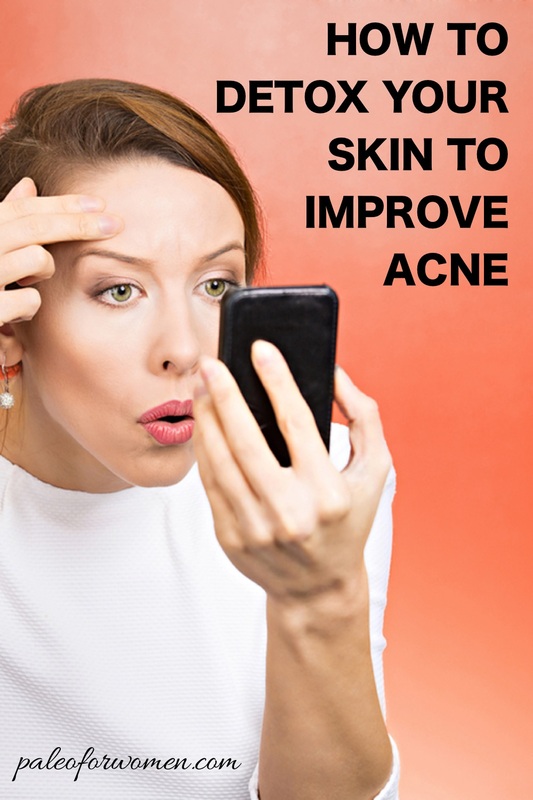 It is very common to find people on the internet saying that acne is a result of toxicity. Acne, they say, is the body’s way of trying to get rid of toxins. They say that acne cysts are toxins leaving the body via the skin. So right off the bat I need to tell you: this idea is wrong, for the most part. Acne is NOT the body trying to push toxins out of the skin. However – there IS a real detox pathway in the body. It’s not through acne. It’s not even through the skin. It is, instead, via the liver. So here is a quick description of what acne really is, and also how the liver’s powerful detox abilities can help you overcome it. Acne is caused by four main factors in the body coming together at once: the genetic make up of your skin, how well your hormones are balanced, your nutrient status, and your level of inflammation. your genes and your hormones cause acne to get started, and inflammation acts like gasoline on the flame. This is the best way I know how to describe what happens in acne with just one sentence. Genes pile up the kindling, hormones light the match, and inflammation adds fuel to the fire. I talk about the skin, hormones, and nutrients often on the blog. If you follow that link, you’ll be able to find many awesome and thorough articles I have written on the causes and cures for acne. For detox in particular, the most important component of acne to focus on is inflammation. When the body is inflamed, one of the most important classes of molecules it needs are antioxidants. Why? For one, antioxidants fight off the damaging free oxygen radicals. For another, antioxidants prevent blood sugar dysregulation, which is inflammatory. For a third, antioxidants directly affect signaling of inflammatory mediators. Antioxidants shield cells by attaching themselves to membranes and acting as protectors. In sum: Anti-oxidants are anti-inflammatory. This makes them absolutely crucial for healthy skin. In fact, the antioxidants zinc, selenium, milk thistle, and N-Acetyl Cysteine (NAC) have been shown to dramatically reduce acne when supplemented with in studies, sometimes as much as by 50% over the course of six weeks. Now – however, anti-oxidants are also big players in the body’s detox mechanisms. If you have a heavy load on your detox systems (which you can read all about here), you will deplete your store of antioxidants. Then, you won’t be able to use the anti-oxidants to support your skin. Likewise, if you have inflammation anywhere else in your body, from your skin to your gut to your brain to your ovaries, you will have fewer antioxidants you need to support healthy detox in the liver. Basically, you have a limited supply of antioxidants. You can only direct them to so many places. The better your body detoxes, the more efficiently it can help you not just become much healthier but also help clear your skin. -Many of the preservatives found in processed foods… steer as clear as possible. -1) Exercise. Do at least three high intensity exercises every week (such as HIIT or weight lifting), and walk as much as possible. The more you exercise, the more you burn the fat and the toxins stored inside the fat cells. (You can replace it with clean, healthy fat later if you like.) And, if it’s particularly tough exercise, sweat can be a great way to get the water-soluble toxins out of your body. -2) Eat in meals. If you wait until you are hungry to eat again, you give your body the opportunity to “clean up” as much as possible before having to direct its metabolic energies toward another meal. Three meals a day is great. You could even have two meals a day or eat in a shortened window every once in a while (though do so with caution, especially as a woman). -3) Sleep well. Sleep is awesome for everything, including detox. Give yourself as much sleep as you can possibly get, in a cool, dark, quiet room. -Sweating. You can sweat during exercise, or perhaps a warm bath, shower, or sauna. Be sure to replenish with sea salt after. My favorite way to replenish is a glass of water with a teaspoon of seasalt, squir of lemon, and half a teaspoon of honey. -Healthy digestion. Most toxins are excreted through urine or stool. You absolutely must not be constipated in order for detox to work. If stool spends too much time in your colon, then toxins will simply be reabsorbed back into the bloodstream. Support a healthy gut with plenty of fruits and vegetables and healthy fats (coconut oil, olive oil, ghee, and animal fat), as well as with probiotic foods like kimchi, sauerkraut, coconut yogurt, and kombucha, or with a good probiotic supplement. Stress is of course a huge barrier to health, and in almost all of the ways. It can impede detox, and it can directly cause acne, too! So sit back and relax, and support your body with nourishing foods. And, as always once we conclude with stress, that’s a wrap! Detox is important for acne, just not in the way everyone talks about. The better and more efficiently you detox, the better and more efficiently you will be able to get your skin the important antioxidants it needs. And that is one huge part of the battle of overcoming acne, for good. Do you have experience with antioxidants? With detoxes? What has worked for you? What’s your SKIN SUPERFOOD?! I’d absolutely love your feedback on this — it’s so important to hear what works and doesn’t! Plus it always gives me ideas for new topics to research! I have had an acne resurgence since the three month mark after going Paleo. The one thing that I believe has really helped is the addition of NAC. Without a doubt improving hormones has helped too. Maca and Vitex have helped with my follicular phase- lengthening by 2 days when I’m diligent to take both and helping me have shorter, lighter periods. But I believe NAC was the final push I needed to make more antioxidants and break out of the cystic cycle. i personally never struggled with acne until a few years ago when i couldn’t get rid of this cluster of acne between my brows. i did my first whole 30 february of 2014, which had me eliminating dairy, so i discovered that the dairy i was consuming was the culprit! very cool finding this stuff out! Acne is never a huge issue for me, my main problem is excessively dry skin. But in the last few days, I’ve had a spring up of pimples that are definitely not PMS related. My first thought is that I have reintroduced sunflowers butter and almonds back into my diet so I was going to take another break from them to reintroduce them one at a time. At the same time, about two weeks ago I started doing Taekwondo which is a lot more exercise than I usually do. Like a LOT more. I’ve also cut alcohol consumption way down. A glass of wine doesn’t sound good after an hour of kicking and punching over and over again. Would your first thought be that the acne is being caused by new exercise regime? Or would you lean more toward the food? Either way, I am testing out the foods to see how I feel without them. When my mom starts clean eating and exercising, her acne gets really bad for about two weeks and then just clears up and her skin looks phenomenal. Just curious about your thoughts. That’s a good question. Perhaps it depends on what kind of acne? If it’s bumpy and near your hairline, I’d guess its sweat from the exercise. If its on your cheeks / jawline, may be the nut butters, since that would be more of an inflammation/hormone spot. And if its cystic, like big, angry cysts that come up from under the skin, i’d look to a hormone / inflammation issue there, too. I don’t think the exercise would make your hormones that bad or inflame you that bad that quickly, so again I’d probably go with the nut butters in that case. Great post!! We cured our acne with a lot of what you said here. NAC is great stuff. Hey! Love everything you do BTW 😉 curious, what research supports that being constipated or having stool allows your body to reabsorb ‘toxins’ back?